One of our missions here at Carrot is to help you grow that freedom, grow that flexibility, increase those finances and finally make the impact that you want to make. That’s really the entrepreneurial dream that we’re all after, is getting that freedom, flexibility, finances, and impact. Now, the cool thing about any kind of real estate marketing, whether it’s direct mail, cold calling, anything at all offline, radio and TV, is your website if you do it right, is actually going to help amplify all of that marketing. Every single day whenever you’re putting out that marketing, people are taking out their cellphone and they’re going to the internet and they’re going to research you. Your company name, the phone number on your direct mail pieces, or the phone number you’re calling from, possibly your personal name and your competitors. If you have a tight strategy and you’re leveraging Carrot to rank well and then perform amazingly on mobile and convert those people into leads and build credibility, you’re going to be winning more of those deals. Every single day there’s tons and tons of deals are lost because people aren’t focusing on the performance side of their online performance side of their offline marketing. People are dropping balls in leaky buckets everywhere when prospects are hitting the web, after seeing your online marketing … Or after seeing your offline marketing or getting a cold call from you and you’re not closing the deal on your website. This call right here is about cold calling. 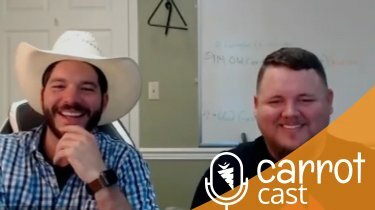 Amazing, amazing clients of ours, Max Maxwell and Tony Robinson, they were at the CarrotCamp recently here in Roseburg, Oregon at Carrot HQ and they really showed how they’re on their own journey to go over $100,000 a month. At that time at CarrotCamp, they were already at about $900,000 in wholesale profits, which is amazing! We’re not going to get into the weeds in this call, but we’re talking about what these guys are doing to pull out so many deals in their market with cold calling. What processes and what tools they use. Also, who they’re hiring and how to pay them. In addition to that, we actually brought Max onto a training program that we created this last year called the Market Leaders Reveal training program. It’s a 10 week, 10 person training where we walk you through the top eight to 10 clients of ours, or just some top eight to 10 clients of ours who are crushing with different types of marketing where online amplifies all of it. One of those types that Max is using, once again, is cold calling. He dove into that process in crazy great detail. At the end of this call, I’m going to give you a link that you can go to get that training, to invest in that training. 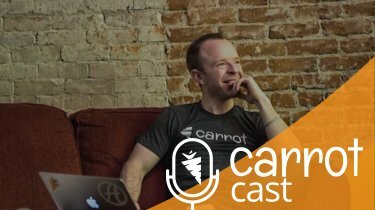 You get access to everything that Max has, including the cold calling scripts and tools he uses and all that stuff to amplify what you learn in this particular episode. 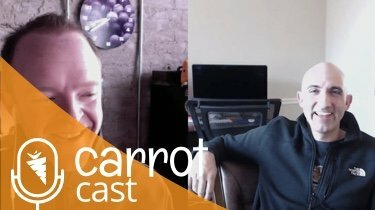 Without further ado, I’m going to introduce Max Maxwell and Tony Robinson to talk about how they do cold calling, how they’re pulling out so many deals in the market with cold calling, and I’m just insanely proud of these guys and to have them as a part of the Carrot community. Learn from them, and I’ll meet you on the other side of this podcast with the link where you can access our Market Leaders Reveal training. 1:25 – Max and Tony intros and what their business looks like right now. 3:25 – Breaking down their cold calling process and why they take advantage of it. 6:15 – How many cold calls do you need to make it worth it? 8:25 – What are the biggest roadblocks other investors have when they contact them. 9:35 – How many cold calls they are making now compared to when they started out. 11:30 – How they utilize data and RVM’s. 14:15 – What is REIRail and how they use it.